I never really realized how much I took for granted. Immediately following the injury, I had very poor body awareness because of the head trauma. It took a little while for the deficits to reveal themselves to me and for me to truly understand these deficits. A lady from my support group has renamed deficits as “souvenirs”, I like that term. Since the epicenter of my brain injury was located on the right side and branching out everywhere into the frontal, temporal, parietal and occipital lobes and hypothalamus, I will share the deficits that affected me and are fairly specific and typical for a right hemisphere injury. An injury to the right side of the brain leaves the majority of noticeable deficits on the left side of the body. I have broken down my deficits into the following categories: Motor, Sensory, Cognitive, Other, and Vision. When I woke up from my coma and surgery I was hemiplegic (half paralyzed). I was completely unable to move the left side of my body. I currently have hemiparesis (left sided weakness). No surprise, my balance was off. Hemiplegia impacted my ability to sit without falling over and, therapists were concerned if I could swallow food safely. Even today, I still drool a little bit, especially when brushing teeth, since I still have some facial paralysis. I also experience spasticity (muscles continually receive a message to tighten, stiffen and contract) and clonus (a series of involuntary rapid muscle contractions). Because of the lack of movement from hemiplegia, I began to develop shoulder and hip subluxation (joint instability or, a partial/temporary dislocation of the ball and socket joints) and scapula winging (the shoulder blade sticks out like you are growing a wing. Trust me there is nothing angelic about it). My muscles in my shoulder, arm, and hand do not work the way they should, resulting in limited fine motor function. Flexor synergies, Internal rotation, Inversion: Results of spasticity, where the resting posture of limbs are in a flexed position. The easiest way I can describe it is a very primal reaction of the body wanting to return into the fetal position. For example, my forearm wants to elevate towards my chest with my fingers curled into a fist, my toes curl, I have drop foot, and toe drag,and my leg rotates inward. When I think hard, sneeze, yawn, or challenge my body physically these flexor synergies increase. A few other motor deficits I have are related to abnormal gait like knee hyperextension, walking with a flexed knee, inability to get heel strike on my affected side. My abnormal gait pattern has started to impact my unaffected side, in that, I am beginning to experience knee pain. In 2011, I was diagnosed with equinovarus contracture deformity (club foot). This is a result of spasticity, flexor synergies, and internernal rotation. I walk on the side of my foot with my toes clawing the floor, with a high ankle arch, and knee hyperextension since my heel does not touch the ground. I am considering the tendon transfer/ toe fusion surgery. I decided to try a new afo with Botox before doing the surgery. My recovery page has a photo of my latest afo. If you were to put xray glasses on, this is how equinovarus deformity looks like. 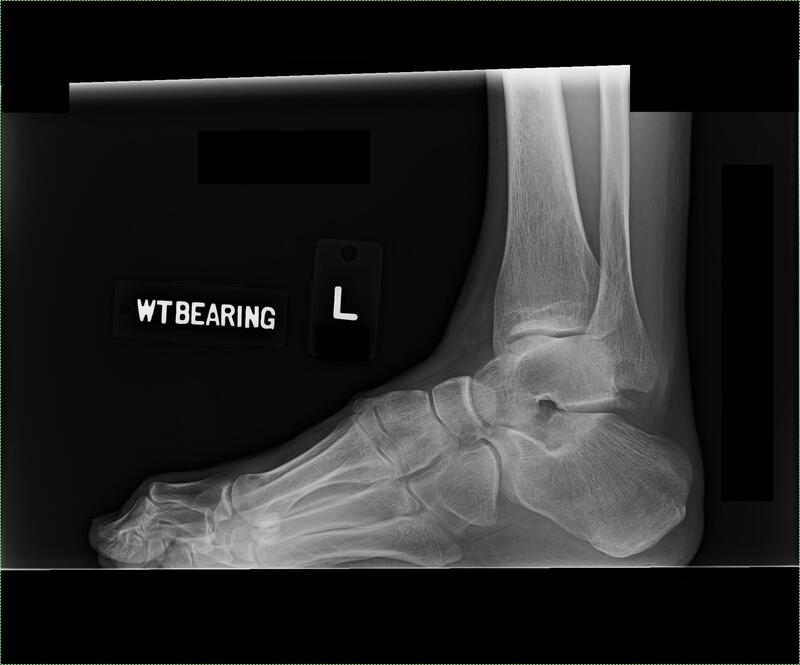 Pay special attention to looking through the hole in my ankle bone (the ankle bone is supposed to stack nicely, without holes), clawing toes, rolled foot. I do not feel the left half of my body. At about a year post injury I began to get some feeling in my thumb however, the feeling I experience in my thumb is not accurate to pressure being applied. A very dense sensory loss adds a whole other dimension to relearning how to walk and regaining fine motor skills. My proprioception (ability to know where I am in space) is terrible. Police Officers typically test proprioceptive tasks in a field sobriety test. How can I touch my nose if I do not know where my arm is? Left Neglect is an attention deficit where I neglected or was not aware of the left side of space. I am half the woman I used to be. Topic Maintenance was my inability to stay on topic during conversation. My pragmatics (ability to pick up on social cues) was non-existent. My “filter” was turned off. I would say socially inappropriate statements. Divided Attention, the ability to divide my attention between two or more tasks, was impossible. I had executive function impairments like the inability to plan and begin tasks. My decision making ability was impaired, even on simple decisions like choosing menu options. I was impatient and a little bit impulsive and verbose. I would need a quiet room to be able to focus on a task I was supposed to do. My short-term memory was impacted. My orientation, knowing what day, year, country, city and who was president was inaccurate. It takes me a lot longer to do things. My overall thinking is slower. I have difficulty doing mental math, or figuring out complicated structures. I have some other deficits that really don’t fit into any other category but, are worth mentioning. I experienced a tremendous amount of fatigue. Rest is an important element of the healing brain. In the beginning, I would hear and feel a sticky clicking noise in my head. That noise is the skull bone settling and healing. I experience swelling at the craniotomy site from time to time and, more often in the morning. I get headaches and nausea from time to time. Sometimes the headaches are normal, other times it feels like I ate too much wasabi. Sometimes, I get extremely lightheaded and dizzy, to the point where I have to hold the wall to not fall. I cannot function. I have to lie down. Along with this feeling I have the feeling of blood rushing away from my face, warm earholes, headache, nausea, and like heavy eyelids. It is very weird. This feeling usually passes in a few hours. I had one “drop-attack” seizure post injury. The lights went out and I fell. EEGs were conducted showing I have epileptiform potential and brain “slow” brain waves in my temporal region especially (another word for “damage”. The extremities on my affected side get ice cold and a little bluish from time to time. I gave myself a few gray hairs. When I shampooed or brushed my hair, there seemed to be more hair that would fall out. My monthly menstrual cycle has still not regulated. I do not dream when I sleep. I am unable to sleep through the night. Left Homonymous Hemianopia is when you lose the left half of the visual field in both eyes. Terson’s Syndrome is when there is so much pressure and blood inside the brain that it hemorrhages into the eyeball. It is like a snow globe of a floating blood clot in the eye. I was also diagnosed with phantom pain behind my right eyeball. My ability to process visual information is slower than it used to be. Since I have some very significant visual deficits, I have dedicated a whole page to share with you. I have worked very hard everyday to try to overcome these souvenirs. This photo of my very cool scar taken about a month and a half post surgery. This was after the 78 staples and the stitches were removed. The incision is a question mark so I guess I will always be inquisitive. While I was still in ICU at UCSF, my Mom brought over my hair stylist to do something with my hair. My head was half shaved and the other half was in an “ICU Braid” (a bloody matted braid that no one could comb through.) Pre-Injury I had long blond hair and never would have thought to shave my head. It turns out I have two cow-licks, a cow must have licked me twice when I was born, and something new I learned about myself.